I have been thinking about salt a lot recently. Maybe a strange way to start a blog for the TIHR Archive Project but actually there are many connections between the qualities of salt and the archive. As an artist I often have the opportunity to put together concepts that at first appear disconnected. Salt and archival practices are a reoccurring feature of Spectral Ecologies, a practice-based research project I am working on that focuses on the Mallee, a geographically and historically complex region of southern Australia. As part of the project, I visited Lake Tyrrell, a salt lake, where I spent time thinking about the relationship between salt and archives, realising that not only are salt and the archive both agents of preservation but they are equally agents of change and transformation. Standing on the edge of a vast salt lake, within the bounds of an ancient inland sea, deep geological time is slightly easier to imagine than from my usual perspective as a city dweller. Lake Tyrrell is a mythical place and the view that opens up across the salt-encrusted lake could easily be mistaken for a heat-induced mirage, an alien landscape or the setting for a J.G. Ballard novel. As I stand looking out, there is an uncanny sense of stillness, the only movement that I see is the shimmer of the heat rising off the horizon in the distance. I become aware of the porous nature of my body in the environment as I imagine the moisture within my own body slowly being dried from the inside out as I breathe the dry salty air. If I stay standing here on the lake’s salt crust, I wonder, will my own molecules also become crystalized and preserved by the presence of the salt? On first approach it seems like time is frozen at the salt lake, it’s curious how it resembles an image of a frozen lake of compacted ice – another ecological register that has the potential to preserve. The value of salt as a preserving agent that protects against decay has been known to culture, science, economy and politics for thousands of years. 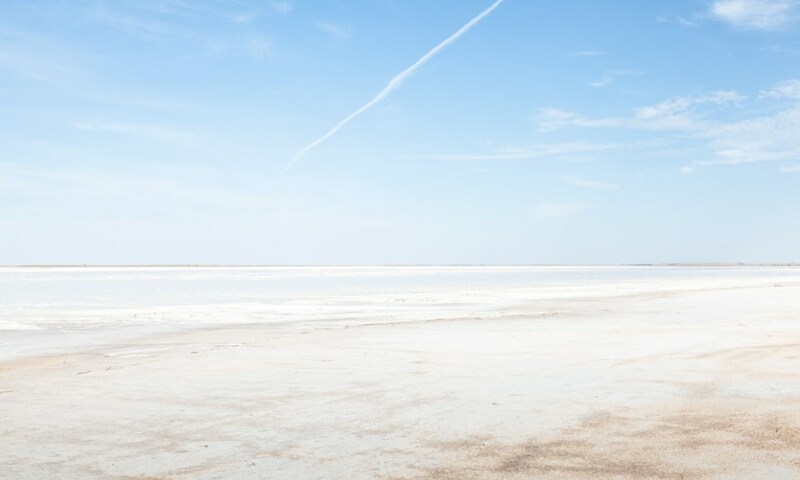 Salt preserves through a process of osmosis, in which microbes are put into a state of arrested growth allowing the tides of time to be slowed down or halted. Salt hasn’t only been used to preserve food, the Egyptians used it to prepare mummies and in certain cultures salt is still used in rituals as a form of protection against unwanted spirits. In more recent times, salt and the locations where salt is mined have been used to preserve other kinds of artefacts and substances, including gold bullion, artworks, nuclear waste and petroleum. The low and steady humidity of deep salt mines also offer a perfect environment for document archives. The Tavistock Institute archive is stored hundreds of feet below the town of Winsford in Cheshire, in the largest underground salt mine in the UK. The salt mine, which has been active since the 1800s, now shares the space with a secure and technological advanced archival storage environment operated by DeepStore; the mine holds library, artefacts and heritage collections from the National Archive, Wellcome Trust and The Royal Society, as well as the Tavistock Institute’s collection. Housed between the solid walls of tightly packed salt crystals that are geological millions of years old stands a much more recent social history attaining to the Tavistock Institute’s own formation, history and working methods documented and preserved since the 1940s. Returning to my own experience of Lake Tyrrell, the salt lake in Australia, also the site of a salt mine but one that is situated above ground harnessing salt from the lake’s surface, I reflect again on the relationship between salt and archives and think about how both contain not only the qualities of preservation but that of mutability. Where I first thought there was no movement or sign of vitality within this vast strange landscape, I also see a complex animated system, one where change is dramatized within the small details of the very ecology I participate in. I grasp something of the mutability of this salted terrain by my heightened sensitivity to the numerous tracks that run across the lake disturbing the flatness of the salt crust. Evidence of the small and large creatures that regularly inhabit the lake is mostly invisible from human view, instead they leave only their trace through a mark of a past movement and presence. But it’s not only the animals that are part of this dynamic ecological system. The salt itself is in constant flux as its crystals dissolve and re-form on the surface of the lake. The first time I visit Lake Tyrrell it is almost completely dry and I walk some distance across the lake. I notice as I walk that my footprints break the crust causing the salt to become slightly slushy. In the space of the indentation small amounts of water gather, over time through a process of osmosis, the salty sediment below dries out the slushy water and fills the indent with hard salt again. This process becomes particularly evident where vehicles have attempted to drive across the lake, leaving behind their salt-filled tire tracks. At different times of the year Lake Tyrrell witnesses other processes of change, such as when darkness comes and the surface of the lake is transformed into a mirror. A shallow film of liquid forms as the saline water from below seeps up through the salt and covers the surface. The effect produces a mirror-like effect on the surface of the lake and on a clear night reflects the stars as if offering a gateway to another world. The Boorong, the indigenous people of Lake Tyrrell, used the reflections on the surface of the salty water for navigation reading pathways in the reflected cosmological patterns. Like the similarities I have drawn between salt and the archive, suggesting both are agents of preservation, I would also suggest that both salt and the archive share the dynamic quality of mutability. My experience at the salt lake demonstrated to me the extent of the change that takes place there on both the macro and micro level, and how various agents: animals, climate, technology and my own presence – for better or worse – participate in and dramatize that mutability. As an artist, I work with various types of archives and archival material, using them as a test-bed for experimenting with visual forms that offer the possibility to bring to the surface cultural histories and micro-histories that can also speak to larger global concerns. I consider the archive as a site charged with potentiality and that can (and should) be opened up to forms of disruption. I think about this as the activation of an archive, in other words, the more you interact and conceptually disturb the contents of the archive the more something that exists outside historical continuity can emerge. Therefore, just as the salt crystals grow in the space where the crust of the lake has been disturbed, the artist’s role, as a dynamic agent, is to disturb the archival material enabling emergent pathways to be produced in and through the space of disturbance. In this way, the material of the archive takes on a new form and is viewed through a different prism by the act of activation, translation and amplification. In my own work, this takes place as a form of a speculative approach to archival material, images and stories that casts light upon discontinuous, disregarded, future and past imaginaries. Salt and the archive have the shared quality to preserve, yet in both we find a dynamic agent of change and transformation – perhaps an echo of the contents of the Tavistock Institute’s own archive which is in its own process of activation as it is pulled from the salt mine and set to work. Sam Nightingale is an artist who investigates notions of the spectral. His practice focuses on research and collaboration through various methods including collaborative-events, photography, installation and video. His research and artwork frequently entails him working with a range of archives from the formal to the personal. Sam is a Professional Partner at the Tavistock Institute. This text was originally written for The Tavistock Institute’s Archive Project – Celebrating and continuing 70 years of innovative and engaging social science practice.